For the intro of this post click here and for construction details click here. Below you find a lot of tips and tricks on how to knit these gloves successfully! I did knit the first stitches of the newly cast on rows. 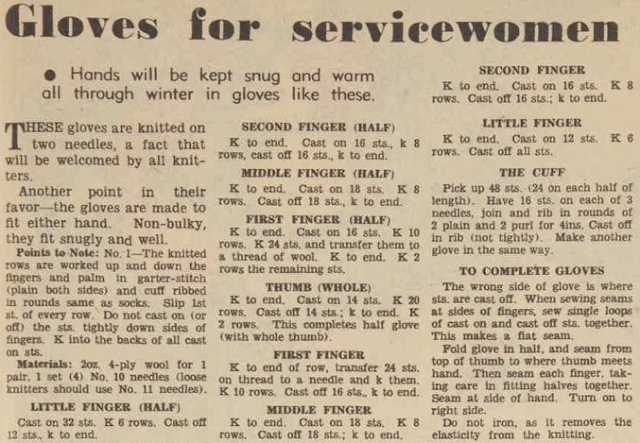 - The pattern instructs 'K (knit) into the backs of all cast on stitches' when starting a new finger. Why should you knit in the backs of the cast on stitches: If you try you can observe that the stitches knitted in the normal way seem to want to curl up while the stitches knitted into the back of the loop lay nice and flat. There are many different methods to cast on and off stitches. The right amount of elasticity is essential for these gloves, so I tried several methods to achieve that. The two methods described below worked for me the best. - Knit the second stitch. - Using the left hand needle, lift the first stitch over the second and drop it off the needle. - You have now one stitch left on your right needle. - Knit the next stitch and lift the 'left-over' stitch on the right needle over the new stitch with your left needle. - Insert the right needle in the space between the first two stitches and knit: yarn around the needle and pull yarn forward. - Transfer the new stitch back to the left needle. - Knit into the space between the new stitch and the second stitch in the same way and put it on the left needle too. - Continue until you have the desired amount of extra stitches on the needle, plus one. - When knitting the row knit this last (extra cast on) stitch together with the first stitch of the existing stitches. Why to cast on an extra stitch? 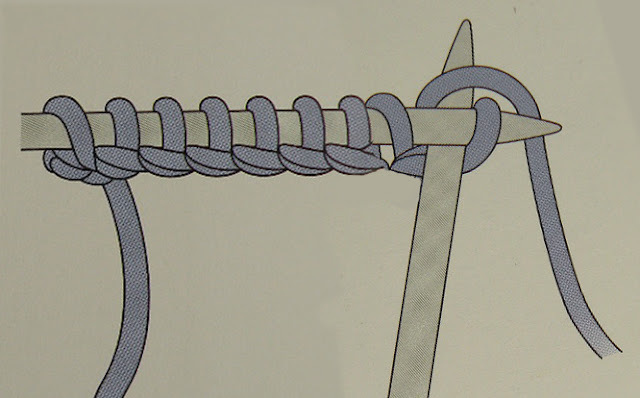 When knitting the row, there is often a longer piece of yarn between the existing stitches and the first newly cast on stitch which creates a weak point. To avoid this and make the place between the fingers firmer, knit the last (extra cast on) stitch together with the first stitch of the existing stitches. If you haven't used these techniques before I would advise to practice it to make sure the new stitches are not too tight or too loose! Here is a picture of how a finger should look like (this side you work on is the wrong side when assembling the gloves) If you have any questions, feel free to leave a comment! How to make a flat seam? - The pattern instruct you to pick up stitches for the cuffs. Since the gloves are knitted lengthwise, the cuff will be knitted sideways to that. - Hold the gloves with the right side of the work facing you. - With the garter stitch the edges will have small bobbles in every 2nd row (instead of chains when knitting with stocking stitch) see picture below. The easiest way is to pick up the new stitches between these bobbles. - Pick up the stitches with a crochet needle and count them. A little trick: You are often instructed to mark the work and distribute the desired amount of stitches evenly between the markings when picking up new stitches. I rather pick up a few more stitches and adjust the amount by K2TOG's in the first row. This is easier and makes a neater finish i.m.o. than leaving 'gaps' when picking up the stitches. I also transfer the new stitches after every 10 stitches to my knitting needle, this makes it easier to count. - I picked up 50 stitches. This is 2 more than the 48 the pattern instructs. We adjust the amount of stitches when knitting the first row by K2TOG's. - The pattern instruct to pick up 48 stitches, 50-48=2 so I had to get rid of 2 extra stitches. I choose to knit 2 stitches together in the first row on either side of the of the thumb. If you have more stitches you should distribute your K2TOG's evenly. Gauge: is not stated in the original description. To determine the gauge needed: Measure the length of your hand palm from the horizontal wrist-line to the middle finger. distract 1/2 inch (or 1.2 cm) from it. This is length should be about the same as 18-20 stitches in your gauge swatch. You can achieve this by using DK-weight yarn or for a large/extra-large size using worsted/Aran weight yarn. By using thicker yarn you can easily adjust the size! I wouldn't recommend using a larger needle because loosely knitted gloves won't be warm. 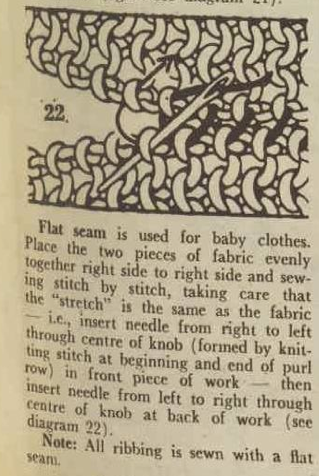 This pattern appeared in an 1943 issue of the Australian Women's Weekly magazine. All original newspaper images through Trove, all other images are mine. Other than that the gloves are perfect!